When we take a multi-day road trip, I despise (yes, DESPISE!) paying a lot for a hotel along our route. We need a clean place to sleep — and maybe free breakfast for my hungry teens. We don’t want to pay for amenities we won’t use. Yet, to get a decent night’s sleep, we usually pay for those unused amenities. Frustrating! About four hours into our last trip, I sprung a relatively new travel app, Hotel Tonight, on my husband. With a smirk, I said, “Don’t worry. There’s an app for that!” He groaned! Hotel Tonight works with hotel chains in major cities around the world to obtain great last minute rates on same day room reservations. Hotels offer inventory at a reduced rate to fill rooms that would otherwise remain empty. Everyone wins! The Hotel Tonight travel app downloads FREE and is available for both iPhone and android smart phones. When you download Hotel Tonight, would you be really nice and use my referral code: KDAWKINS2? Using my referral code, you save $25 on your first Hotel Tonight booking! And when you book, I get $25 off my next booking. We both save! What I like about Hotel Tonight. There’s lots to love about this app! The app is intuitive — very easy to use. Everything is clearly stated: check-in times, number of people per room, dining on site and cost. I checked a Pittsburgh option for tonight, and the info page included that the hotel is currently undergoing renovations. Very thorough! 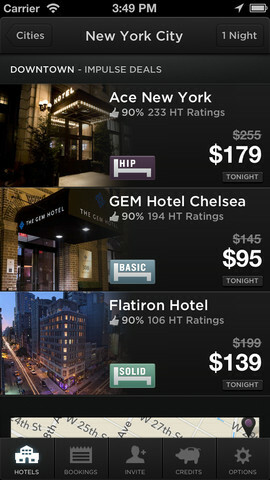 The app maps hotel location so you can select the hotel that best suits your needs. Multiple night purchases are available. Rates, including rack rate and Hotel Tonight rate are prominently displayed. Room purchase is easy — you must provide credit card and contact info for purchase. Before final purchase, the app alerts you that all sales are final and non-refundable and then requires you to trace an image on the screen. No accidental purchases! What I don’t like about Hotel Tonight. There aren’t enough hotels participating yet. It would be nice to have hotel options along major travel routes (I-95!!! ), not just in major cities. Hopefully, more cities and major travel destinations will be added as well. I’d appreciate more family options. Room guarantee is for two adults per room. We did book a room at an “all suites” hotel through Hotel Tonight, and the room slept six. This option isn’t always available, though. When we checked into our Hotel Tonight room, a suite sleeping six that included free hot breakfast and cost only $49 including taxes, my husband admitted, “Nicely done!” We both like the Hotel Tonight travel app and are certain to use it again. Soon, I hope! I was not compensated for this review. I really think this is a great travel app! I hope you’ll download Hotel Tonight (using my referral code: KDAWKINS2), so you can save when you travel. This could be so handy! Before I was sick, I used to LOVE to take off on road trips and just end up staying somewhere – an app like this could get me an even better deal ;). Now, to just feel well enough to go on a road trip again lol! Very cool! I’ve previously used Priceline as a similar last-minute tool, but will definitely have to try Hotel Tonight. Thanks for the review! I’ve never used an app, but priceline.com is my friend. I’ll check out the app and if I use it; I will most certainly use your referral code. Thanks Amy. I have used Priceline too. Happy travels.